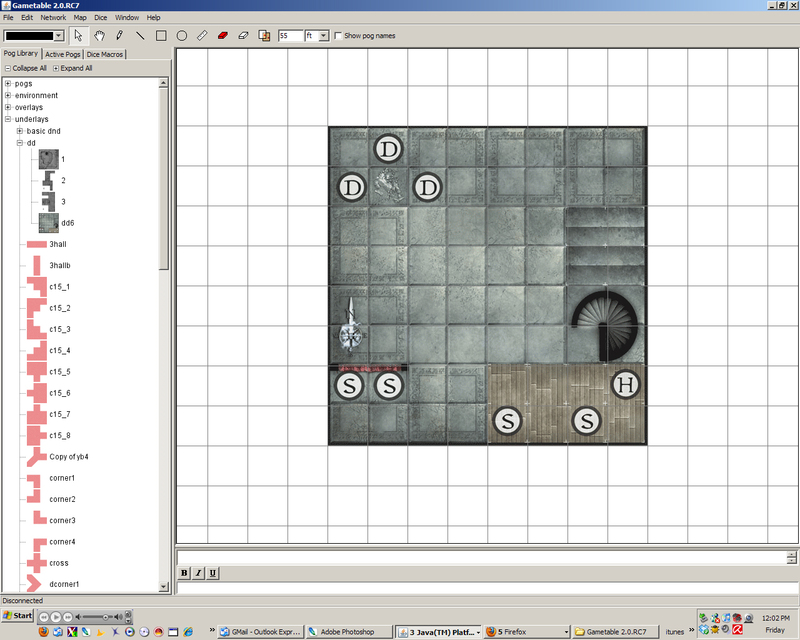 Here’s a quick guide for using jpegs of freely available maps on Gametable. It is very simple, and not a lot of experience manipulating graphics is required. I’ve written a bit about my experience with Gametable before, so I won’t get into it here. What I will say is that if you are intimidated by Maptools due to its multitude of features and learning curve, then Gametable is for you. 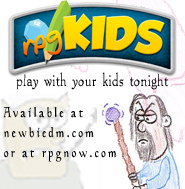 It is simply a bare bones way to play D&D online. So a square on Gametable’s grid is 64×64 (pixels). What does that mean exactly? It means that the tokens and the grid that come with the program are that size, so if you want to import a map, it has to be that size as well. But who cares about the technical, lets get to the practical. I’m going to work with Wizards of the Coast’s online map galleries. Specifically, it’s Dungeon Delve gallery. You can find it here. Yes, you do need to be a DDI subscriber, but if you want find another map elsewhere and follow along. The concept is the same. This map is 8 squares high, and 8 wide. So, remember how I said that the Gametable square is 64×64 pixels? 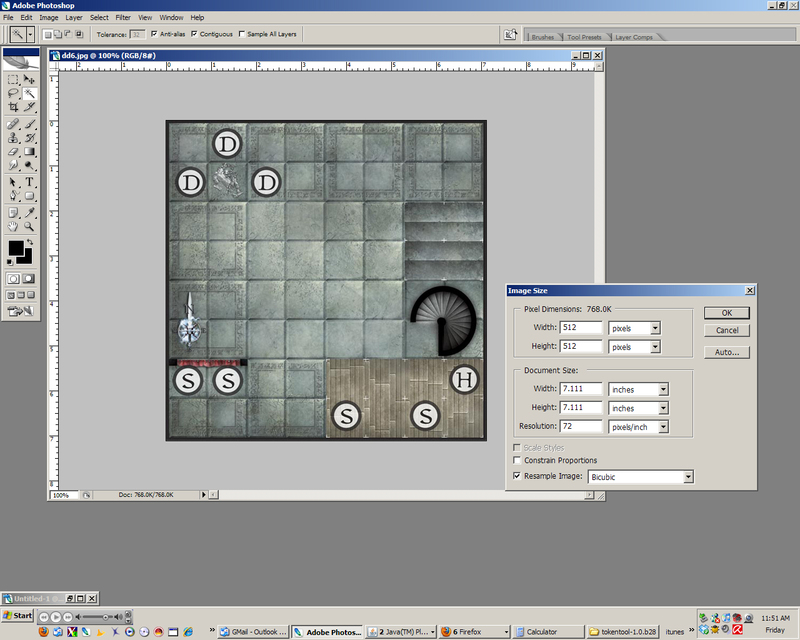 We now multiply 8×64 to get the height and width that we need to make the map in order to properly use it in Gametable. It’s 512 pixels. So our map needs to be 512 pixels high and wide to work with Gametable. Lets resize it in photoshop. Go to IMAGE->IMAGE SIZE and enter 512 for both the height and the width. Hit OK.
Once you’ve resized it, you need to save it as a PNG in order to use it in Gametable. That’s easy. Go to FILE->SAVE FOR WEB. So what have I done? See what I’ve circled there? I made it an 8bit PNG, with only 64 colors, in order to reduce the file size and make it easier to run in Gametable. Larger files tend to slow it down, and this quality is good enough for online play. So once you’ve saved it, you want to place it in the “underlays” folder of your Gametable folder. This is the folders where your maps should go. Once you do that, grab it from the gallery and place it on the board. It should line up nicely with the grid, and the tokens should snap to it during play. The grid can be removed, you do not need to have it up the whole time, by the way. 1. Multiply its square height & width by 64 and resize both to that amount. 2. Save as a png file. 3. 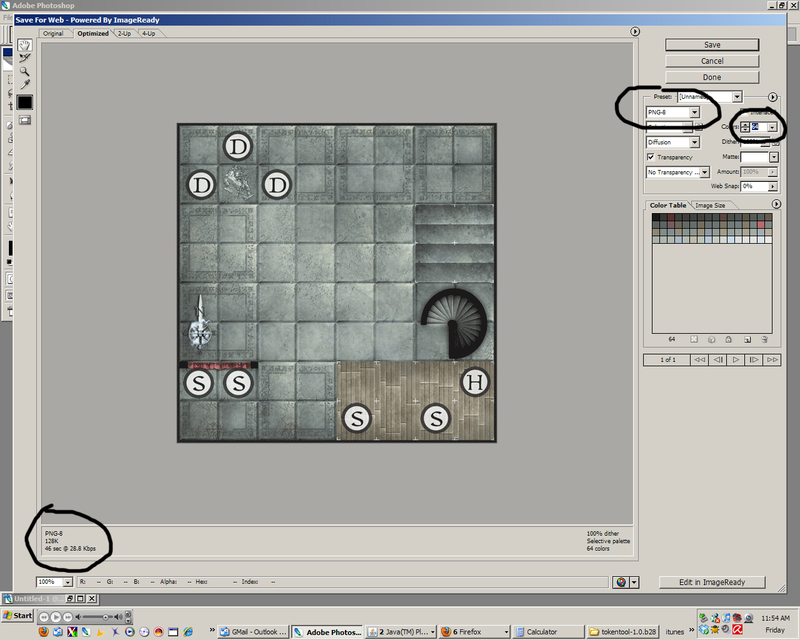 Place inside the “Underlays” folder in Gametable folder. In a future tutorial I’ll go over other things, like making tokens for Gametable, and hosting a session. This sounds like something these two left thumbs can use. Can’t wait to hear how to make tokens and other useful tidbits. Bookmarked for safe keeping. I’ve had some issues in the past getting my maps to scale just right. Thanks for this. I was going to try Gametable out with my nephews and I was wondering how to do something like this. Great idea. But any idea how to Photoshop the monster locations out. I’m thinking copy/paste existing tiles over them, but that doesn’t always work out. I know its been a while, how do you manage with the non tiles maps from dungeon magazine, especially those that have ‘part’ squares around the edge? Have you tried Roll20? It may be better than Gametable. I haven’t used Gametable in a loooong time now. Roll20 is a lot better.